As a small business owner, chances are you’ve already considered whether or not to incorporate your growing business. With a great number of advantages to doing so, this may seem the smartest decision for your business. As with anything, there could be some disadvantages, too. So how do you know if it’s time to incorporate your business? Here we’re sharing some key advantages and tax benefits of incorporation to help clarify the right path for you. If your business is not incorporated, anyone can start a business with the same name (or similar name) which may impeach on your reputation and leave you unprotected. If you want to make sure your business name is yours and only yours, become incorporated. When you do, your company name becomes reserved solely for your use and no one else may use the same name without legal ramifications. As a possible perk, having “Incorporated”, “Limited”, or “Corporation” in your company name often leads people to believe your business is more reputable or stable than an unincorporated business. Whether that’s true or not, incorporating certainly is a more complex process to carry out. Rest assured, Keenans Accounting Service Inc. can help! One of the key advantages of incorporating your business would be the limited liability of the incorporated company. As a sole proprietor, the business owner (you) assumes all liability of the company when a business is incorporated. This means your personal assets (house or car) can be seized to pay the debts of your business. As an incorporation, a shareholder’s liability is limited to the amount they’ve each invested in the company. Once incorporated, a shareholder (you) can’t be held responsible for the corporation’s overall debts — unless you’ve given a personal guarantee, of course. When your business becomes incorporated, you have a chance to decide how and when you are paid from the business. As a sole proprietor, you are typically paid by the business when it receives income. As an incorporated business, however, you are able to take your income at a time when you’ll pay less in taxes. You’re also able to lower your tax bill by choosing dividends instead of salary. Plus, there is the option of income splitting with your spouse and/or children if they are shareholders. This allows an opportunity to redistribute income from family members in higher tax brackets to those in lower tax brackets and save on taxes. If you’re looking for ways to financially grow your business, incorporating may be the best route for you. Compared to sole proprietorship, corporations can raise money through angel investors and venture capitalists. The advantage of equity financing is that it incurs no interest and usually doesn’t need to be paid back, since you sell shares of the company to investors in exchange for financing. If you’re looking to pass your business down through the generations, a corporation has an unlimited lifespan. It continues to survive even if the shareholders die or leave the business. This also rings true if you sell and ownership changes. Still unsure if incorporating is right for you? We’re here to help! With solid advice and a good accountant handling your books for you, you’re sure to come out on top no matter what you choose. 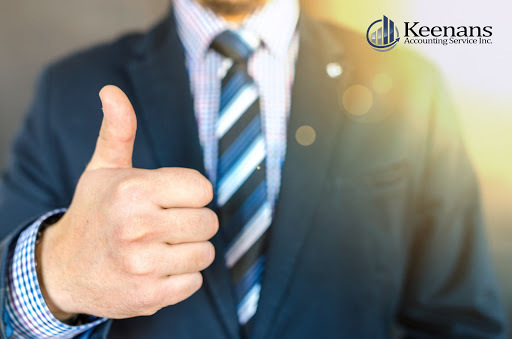 The team at Keenans will help ensure your business runs smoothly through every stage of growth. Keenans Accounting Service was founded in 1998 to serve the Midland and surrounding area. We’re a professional team dedicated to helping you define your bottom line. We keep a keen eye on your numbers so you don’t have to.